Join us at KALEID Gallery for this upcoming TWO BUCK Tuesday, May 21st, 7pm-10pm! 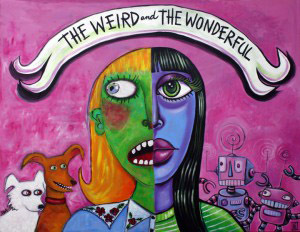 Artists Murphy Adams and Christine Benjamin whose feature show “The Weird and the Wonderful” is up in the main gallery will be there doing collaborative drawings which they’ll have for sale. They’ll also be on hand to answer questions about their work. Each artist will start a drawing then switch, coming up with something completely unique in the spirit of the Exquisite Corpse. This upcoming Two Buck, get a dose of the high fashion that will be featured at the Blitz Runway show that will be on the main stage of the upcoming 6th Annual SubZERO Festival! Lacey Bryant, one of the collaborating artists for the fashion show, will be practicing some of the face paint techniques that we will be showcasing on the runway in exchange for donations! Help us put on this awesome event and get some cool designs on your face at the same time! The San Jose Yarnbombers will be working on their upcoming yarnstorm. Stop in and knit or crochet a 6 inch square and you can be a part of the action! You can also help us stitch squares together into patchwork. We’ll bring the yarn, you bring your needles or hooks. If you have squares to drop off, this would be a great time to bring them by, too! Lara Sophia will host a meditation, yoga, martial arts themed drawing session. Bring your sketch pads and draw folks in poses of concentration or take a turn posing yourself while others draw you. Enjoy Live Music By Rebelskamp! TWO BUCK Tuesday is May 21st, 7pm-10pm!